Mercurial and highly moral, this Doctor would often despair at the cruelty and wastefulness he encountered across the galaxies. In this exclusive Seventh Doctor Set from Underground Toys we present the Seventh Doctor action figure with Electronic Classic TARDIS as they appear in the ‘Curse of Fenric’. 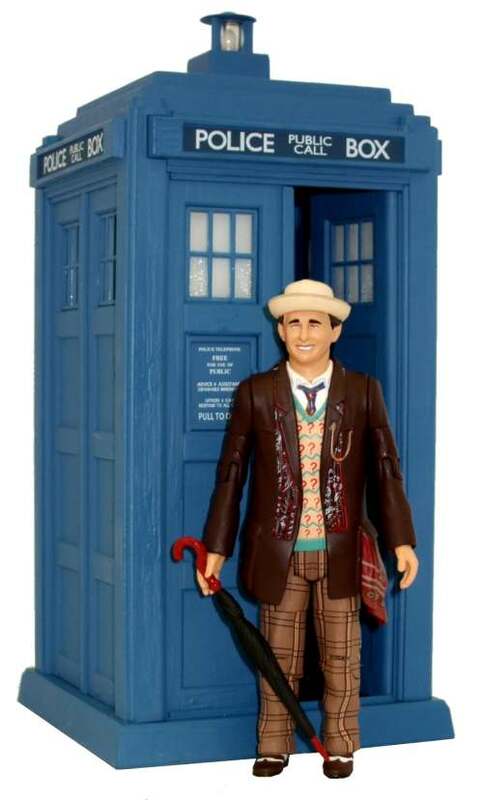 The Doctor comes with brown jacket, umbrella accessory and an Electronic TARDIS. The Classic TARDIS features opening left door with telephone cubby hole, a spring activated right hand door and features takeoff and landing light and sound effects. This is the first time that an authentic Classic Tardis has been produced for the Character Option line of Doctor Who figures – something fans have been requesting for ages. We expect demand to be high so please order early. I hope they will remake this set but with Peter Davison and Rhe Tardis seen in seaso 18 and 19, with the opposite door opening.